It’s written in the New Testament that Jesus was crucified at Golgotha, the “place of the skull.” In addition, it is believed Jesus of Nazareth died on the cross in the year 33 A.D.
Nearly two thousand years years later, the Church of the Holy Sepulchre, allegedly the crucifixion and burial site of Jesus, remains the holiest site in Christendom. Time may have passed, but the church has not lost its religious significance. In May 2014, I had the opportunity of a lifetime to travel to Israel and visit the ancient city of Jerusalem, which was originally built some 6,000 years ago. Truly, it’s one of the centres of the religious world. Thousands of pilgrims and travelers alike come to see the Church of the Holy Sepulchre, the tomb of Christ and to feel the annointing stone where Jesus allegedly had his wounds dressed after death. Few, however, know the ancient history of the church itself. After the death of Christ, a temple to Aphrodite was built over the site. A common Roman tactic, it was designed to stop people from praying or devoting themselves to the new religious order started by Christ. During the rule of Constantine the Great (272 to 337 A.D.), the tomb to Aphrodite or Venus was demolished to make way for a church. The first Christian emperor is said to have discovered an important tomb, that of Jesus. In the year 326, Helena, mother to Constantine, traveled to Jerusalem where legend says she found a piece of the True Cross at the site of the former temple. Years later, the first church was built on this special site. In a passage from Martin Biddle’s The Church of the Holy Sepulchre, it is written that a traveler from Bourdeaux, France visited Jerusalem in the year 333 A.D.
At that time, he is said to have witnessed the construction of the first Holy Sepulchre, built in the name of Christ. Seven years prior, Markarios, bishop of Jerusalem, found Jesus’ alleged tomb under Constantine’s watch. Today, thanks to Church father Eusebius, we know the tomb was found under the previous temple to Aphrodite. Prior to this, he knew Emperor Hadrian was the one who had the Aphrodite temple build in the first place. It is said that Constantine had the rockface surrounding the tomb removed, creating a rotunda where the tomb lies. In 614 A.D., the Holy Sepulchre was destroyed by Khosrau II of the Sassanid Empire. In 631 A.D., Emperor Heraclius negotiated the return of the True Cross, which was taken in the earlier campaign against the church. Today, the True Cross is a mythic symbol of Christendom, lost for centuries. The caliph Al-Hakim ordered the destruction of the church in 1009. Some 90 years later, the hurt this caused Western Europe’s Christian population forced the beginning of Pope Urban II’s First Crusade, a bloody massacre. Byzantine Emperor Constantine IX Monomachus (1042-1055) funded the rebuilding of the church. The reconstructed church drew visitors from all over the western world in the early half of the 11th century. By the late 11th century, rumours started that Christians were being mistreated by the ruling Seljuk Turks. The victorious crusaders entered the Church of the Holy Sepulchre on July 15, 1099 after breaching the walls and taking the city by brutal force. Godfrey of Bouillon named himself the defender of the Holy Sepulchre. 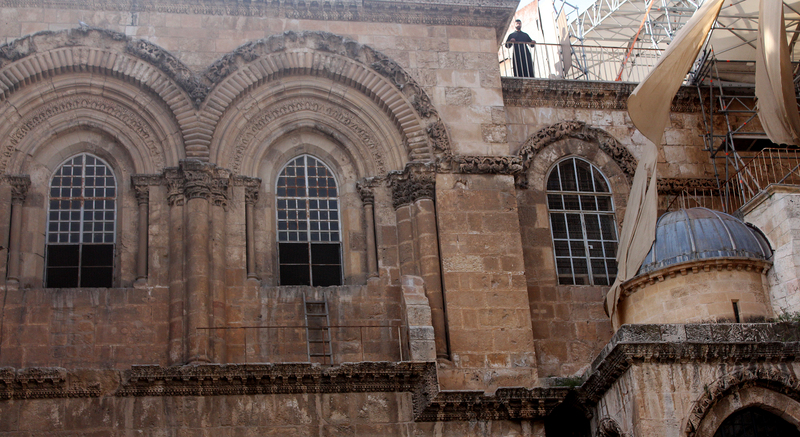 Throughout the centuries, the Church of the Holy Sepulchre has been taken by victors, but it’s never lost its holy meaning to people then and now. The church is home to the Greek Orthodox Patriarch of Jerusalem. As well, branches of Eastern Orthodox, Oriental Orthodox and Roman Catholicism call the Church of the Holy Sepulchre home. To this day, standing before the rotunda, the alleged burial site of Jesus Christ is a moment I’ll never forget. 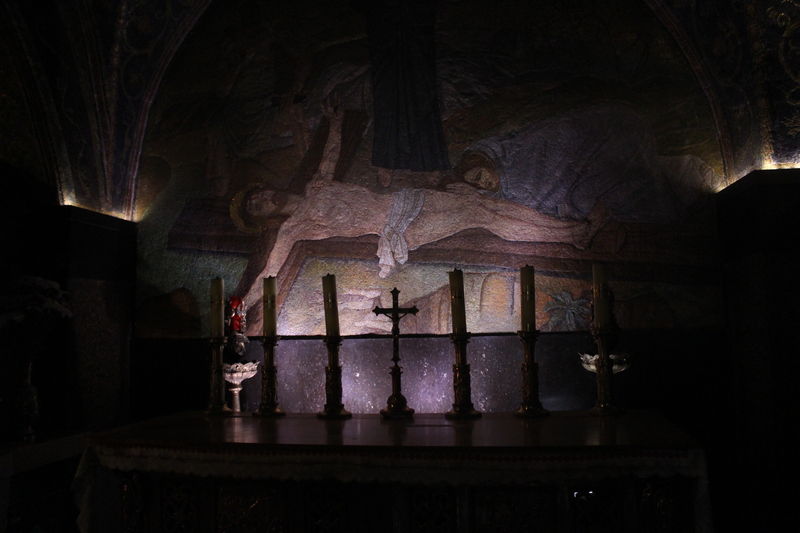 One can even touch the stone, which was said to have held the cross itself.